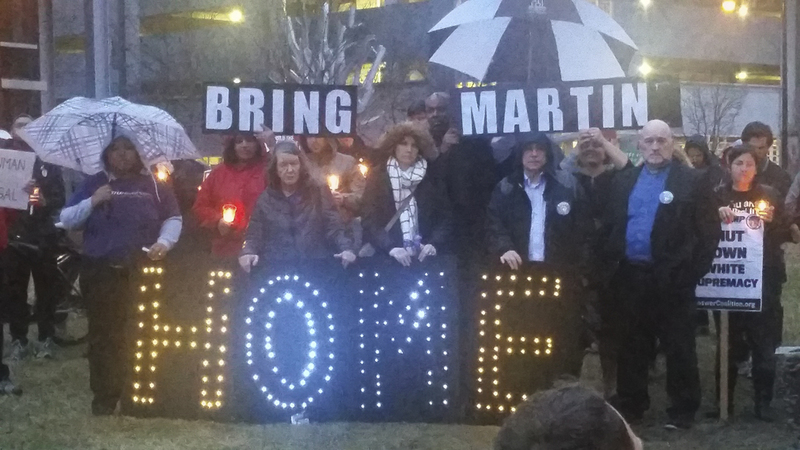 While Martín Esquivel-Hernández could not speak to his supporters directly in Pittsburgh, his words were still heard. Esquivel-Hernández, a former Pittsburgh resident who had been in prison for nine months on charges related to undocumented immigration, was deported Tuesday. At a protest Tuesday night in his honor, Christina Castillo, an organizer with the Thomas Merton Center, read aloud one of Esquivel-Hernández’s letters written from prison. Castillo was one of about 100 people who gathered at the corner of Hot Metal and South Water Streets Tuesday night to protest the deportation of Esquivel-Hernández. The event, hosted by the Thomas Merton Center — an organization dedicated to social justice activism — included speeches on the lawn, followed by an attempt to march onto Hot Metal Bridge. Before they could march, Pittsburgh police guided protesters back to the lawn so that they would not block the intersection and halt traffic flow. “No more deportation,” rang through the streets as a few cars passed the crowd, honking to show their support. Esquivel-Hernández had spent the past nine months at the Seneca County Jail in Ohio after failing to present a valid U.S. driver’s license and was caught attempting to cross the Mexican border into the U.S. on four separate occasions between November 2011 and May 2012. Ultimately, he was detected in summer of 2016. The angry protesters shouted, “Shame!” during mentions of the office of Immigration and Customs Enforcement, the federal agency that chose to deport Esquivel-Hernández. Faith, community and labor leaders also showed their support throughout the last few months in an effort to keep him in the country, including Mayor Bill Peduto, Congressman Mike Doyle and Roman Catholic Bishop David Zubik. The protest was peaceful yet emotional as the participants gathered in a large circle holding signs, flowers and candles. Esquivel-Hernández’s family was also present, specifically his wife, Alma Brigido, and their two daughters, Shayla, 11, and Luz, 9. Alma read a passionate letter to the crowd, which was in Spanish, while a translator relayed her words of hope to everyone in attendance. The deportation case was under the jurisdiction of ICE Field Office Director Rebecca Adducci, whose office received an influx of calls and letters from 1,400 people in support of not deporting the man. In addition to the people who sent in letters voicing opposition to the situation, other protesters joined in on the message to speak about the great injustice of deportation. While some speakers focused on how “immigration is a natural thing,” others pointed out that America is a country made up of immigrants. One supporter sang in Spanish and played her cello, accompanied by a saxophone player. Kai Pang, 22, of Bloomfield, and an organizer with Pittsburgh United—a coalition of community organizations who work to improve Pittsburgh communities through policy campaigns—joined this particular movement because he sees immigration issues as workers’ issues. He noted that while deportations have been ongoing, the current political climate is also a contributing factor to the growing support of deportation. “Deportations are nothing new, and I think the rhetoric under this new administration has definitely emboldened ICE as an institution to further go about their policies without any sort of retribution,” Pang said. Pang also said that deportation stories have “always been there,” but that now, stories such as Esquivel-Hernández’s are more often brought to light with protests and public outrage. Part of this public outrage comes in response to President Donald Trump’s latest actions. On January 27, Trump signed an executive order that banned entry from seven countries that are heavily populated with Muslims: Iran, Iraq, Libya, Somalia, Sudan, Syria and Yemen. Esquivel-Hernández’s event, then, was just the second in a pair of Pittsburgh immigration protests in the past week. Some Pittsburghers fought Trump’s order on Jan. 30 by taking to the Pittsburgh International Airport and protesting. While the rally at the airport enforced the idea of solidarity, Tuesday night’s protest ended on a somber note. Sister Janice Vanderneck — a director of Casa San Jose who works closely with Latino immigrants in Pittsburgh. — left the rally with a parting message about immigration rights, not just for people in Pittsburgh, but for everyone in the nation.